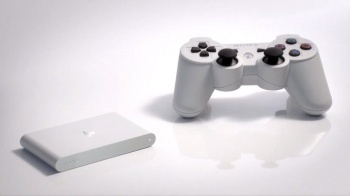 PS Vita TV will be available in Japan on November 14, for around $100. Sony has unveiled a brand-new piece of PlayStation hardware at its special Tokyo press conference this week. The PS Vita TV is a small box that players can hook up to their TV, in order to bring their PS Vita and PSP games to the big screen. Basically, it's a Super Game Boy or Game Boy Player for Sony's handhelds that doesn't require the PS4 to run. The PS Vita TV will be available in Japan on November 14, and will retail for 9,480 yen (which is around $100 USD), or a bundle featuring an 8 GB memory card and a DualShock 3 will retail for 14,280 yen ($150 USD). You'll be able to hook the DS3 to the device and play your Vita/PSP games using the controller. No pricing or release date information for any other territories was provided. The actual device itself is tiny; just 6 centimeters by 10 centimeters, said Sony's Andrew House, and as well as the aforementioned Vita/PSP compatibility, will also allow users enjoy video services on their television, including Hulu and Nico Nico (Japan's answer to YouTube). PS4 remote play compatibility will come to the device via a later system update. This should be a quite cool feature for those of you who have big houses with multiple TVs, as you won't have to lug your console from the living room to upstairs when someone wants to use the big-screen TV.